Any chocolate loving person is bound to enjoy truffles. They are so deeply rich and chocolatey. I was intrigued by this particular recipe (which I found in some cookbook or other and promptly forgot the name) because the cream is steeped in spices and honey. I loved the idea; however, the spices were very subtle in the end result. If you want more of the cinnamon to shine through, I'd try doubling the amount of cinnamon stick. 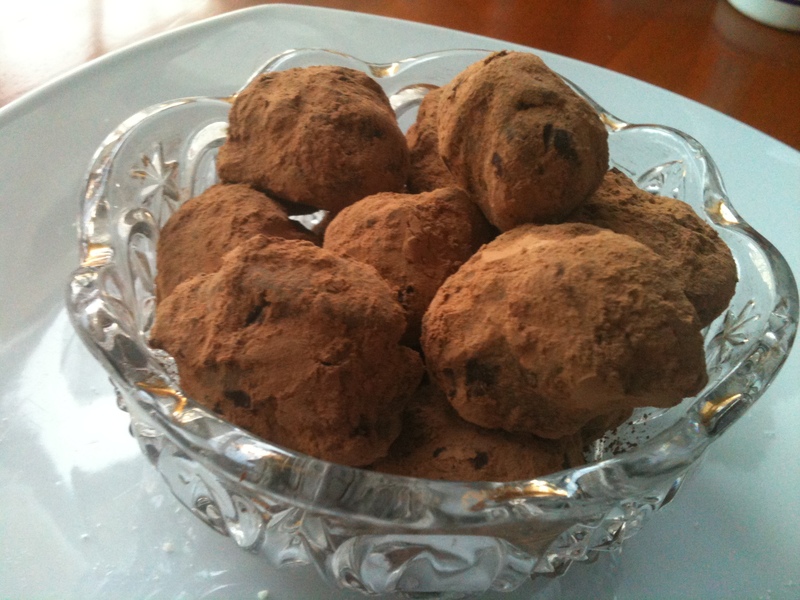 Or, you can do like I did and sprinkle a little cinnamon into the cocoa powder that you roll the truffles in. Either way, these are delicious drops of chocolate, perfect for a holiday goody tray. In a small saucepan over medium heat, combine the cream, honey, vanilla, cinnamon stick, cloves, and salt. Bring to a boil, reduce the heat to low, and simmer for 5 minutes. Remove from the heat. Pour the cream through a fine-mesh sieve held over the chocolate, discarding the contents of the sieve, and let stand for 2 minutes. Using a rubber spatula, gently stir the chocolate mixture in a circular motion until it has completely melted. Add the butter and stir until incorporated. Cover the bowl with plastic wrap and set aside at room temperature for 30 minutes to set the chocolate. Then refrigerate the chocolate for 30 minutes, or until the chocolate is able to be scooped and rolled into balls. Line a rimmed baking sheet with waxed paper. Using a small spoon or scoop, scoop out 1-inch balls of chocolate and gently roll them into irregularly shaped truffles. Place them on the prepared baking sheet. Return the truffles to the refrigerator and chill until firm, about 1 hour. Place the sifted cocoa powder in a shallow bowl. One at a time, roll the truffles in the cocoa, coating evenly. Makes about 30 truffles. Cook's Note: The truffles will keep up to 2 weeks in the refrigerator. These look (and sound!) amazing! !